Please enter your username and password below, if you aren't already a member why not join us? IT'S FREE! Welcome to Percussion Zone... Part of Drumroll Productions - here you will find a wide range of percussion based instruments and accessories all hand picked and recommended by Nigel Shipway and Anne Collis ARAM - we also have clothing and stickers for Drumroll Productions and Percussion Zone. If you have any questions or requests please get in touch via the contact page or give us a call. Happy Shopping! Not sure where to start? looking for a gift? Please click on the icons below to find out more about each of our categories and products. 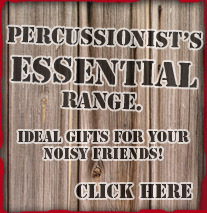 If you're looking for a gift and not sure what to get, check out our essentials for beginners by clicking here, The kits include - tools and instruments for every day percussion requirements.